Chris Hughton reflected on a 'pleasing' win against Swansea City but stressed he felt his Brighton & Hove Albion side could have scored more. 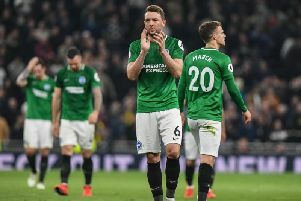 A Glenn Murray brace along with goals from Anthony Knockaert and Jurgen Locadia on his Premier League debut gave the Seagulls an impressive 4-1 success over their Welsh visitors. It lifted the Seagulls to 11th in the table and gives them a four-point gap over the bottom three. Murray's first-half penalty ensured a 1-0 lead at the break and the striker netted his 12th of the campaign with 21 minutes left to give the home side a 2-0 advantage. Knockaert quickly added a third and although Swans substitute Tammy Abraham pulled one back with five minutes to play, Locadia came off the bench to notch on his Premier League bow. While Hughton was delighted with the win, he expressed a belief that they could and should have scored more. The Albion boss said: "It was very pleasing. We are on a good run, sometimes when you are on a good run those confidence levels are a little higher. We had to go through a difficult period today as particularly first half, they showed what a good side they are. "A side similarly to ourselves that are in a good confident mood. I think as the game went on it opened up and we really capitalised on that. It's probably the game this season when we could have had more as well, there aren't too many games where you can say that. "I can't say it's the best performance, but in the form we are in, it is probably the game when you are on the touchline, you fancy us to get more goals. We haven't always been like that and the reason we haven't been like that is the level we are now playing at - we are playing very good teams. "They opened up a bit Swansea and went for it. Normally when a team goes for it it is either going to go either way and it certainly went for us." Hughton also pointed to Swansea hitting the post at the end of the first half through Jordan Ayew as a big moment in the clash. He added: "It's saves like that and misses and opportunities like that that change the game if they score that one just before half-time. "What they did was change the formation a bit in the second half, because I think they sensed they can put more pressure on us. If they score the goal, maybe they don't it becomes a bit of a less-open game, but they are the moments that change games."